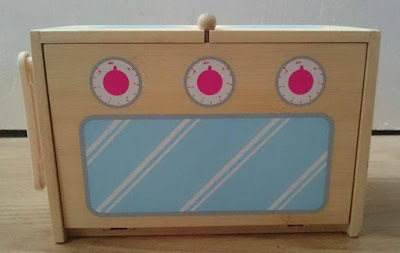 May is Woodplay month at toy company Casdon and I am so pleased to have been able to review one of their fabulous wooden toy sets which are aimed at children aged 3+. There are three boxsets in the range; Pirate Island, Beach Villa and a Kitchen Set. 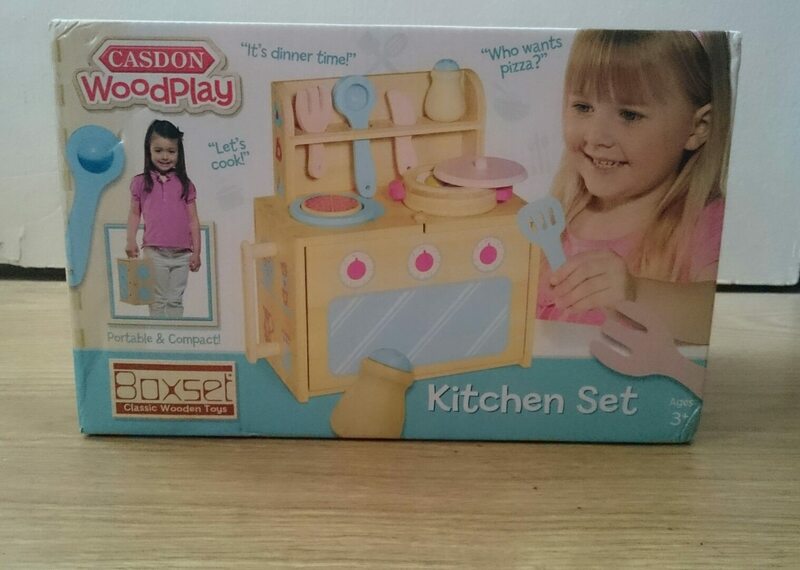 C absoutely loves pretending to cook so I had to opt for the kitchen set. 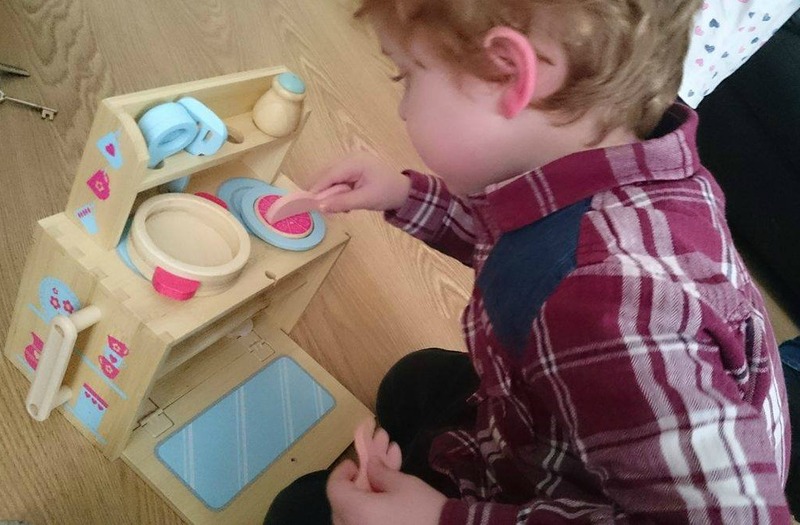 He's always playing with the large wooden kitchen when we go to softplay. When the box arrived it was smaller than I thought it would be, but in a good way. It's great for carrying around especially on Saturdays when we visit my parents so he can bring it with him easily. One of the first things that I noticed, obviously after accepting this toy for my son to play with was the fact that there were only girls playing with the kitchen on the box. 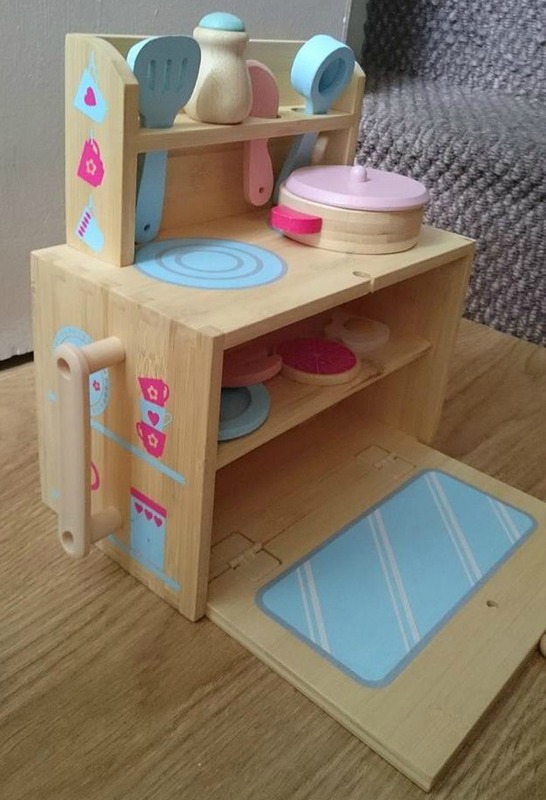 It's not a massive deal but boys like kitchens and cooking too so it would have been nice to show that it's a toy that is aimed at both genders. 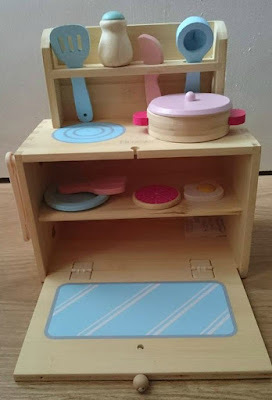 All of the pieces were kept inside the main oven part of the kitchen set and it was so simple to put together, it was just a case of slotting the utensil rack into the top of the wooden box part then setting up all the little play pieces. Opening and closing it is easy enough for kids to master with a little bead and elasticated string. All of the pieces are made from bamboo wood so it's not too heavy for C to carry around but still sustainable. We did have a incident where he dropped it from a height and the corner cracked. It was nothing that a little wood glue couldn't fix though. The paint work on the set is beautiful and they've really thought of everything. The cute shelves and jugs on the side are my favourite. The wood itself is finished and varnished so I had no worries about splinters or other injuries. We received this set about 3-4 weeks ago and it has been played with every single day by both children. C especially (aged 3) loves to cook for mummy and daddy and it is lovely watching him get so much enjoyment out of it. 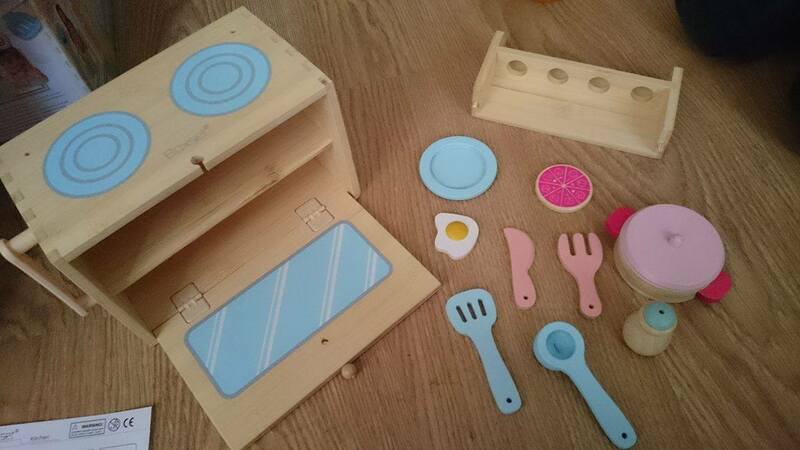 The other two woodplay sets are definitely being purchased for this kids birthdays this September. 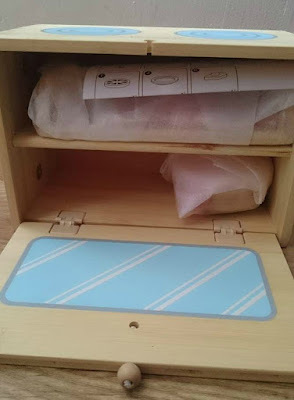 The Woodplay sets retail at £25.00 which I think is a really reasonable price for what you're getting and how much children will have, and you can purchase them from Amazon. If you want to find out more about the range, you can do so at the Casdon website. You can keep up to date with all things Casdon on Facebook, Twitter and Instagram. 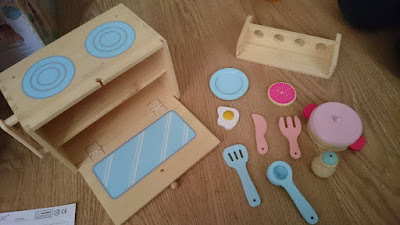 1 comment on "Casdon Woodplay Wooden Kitchen Set - Review"